A highly addictive puzzle game made in the spirit of Bubblet. Bubble Bomb adds the extra element of bombs which you can earn to help you on your way. Bombs clear troublesome bubbles off the playing field and let you apply some strategy to the game, they can either be used to get you out of trouble or to get you into a position for the really big scores! Either way - if you liked Bubblet, then Bubble Bomb is the game for you! 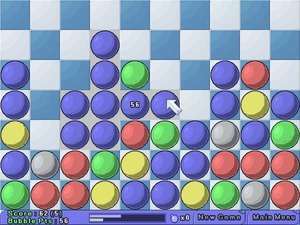 Bubble Bomb 1.5 is a shareware program and can be used as a demo to try the software until the free trial period has ended. A full version of the program is available after the trial period ends. For security reasons, you should also check out the Bubble Bomb download at LO4D.com which includes virus and malware tests. Additional screenshots of this application download may be available, too.